Come and join us at 2:00 pm for guided tours with the curator at the Fielding Garr Ranch. See the entire ranch site from the original ranch house, shearing barns and corrals. Please be sure to dress for the weather as the tour is in the cold weather. For more information call (801) 649-5742. Join the park naturalist for a guided hike to Buffalo Point to watch the sunset. Meet at the Buffalo Point trail head at 6:45 pm. Learn about the sun’s energy and how it affects the plants and wildlife on Antelope Island. At the top of the hike enjoy gorgeous views of the sunset and Great Salt Lake. Dress for the weather. Bring a flashlight for the hike down. The hike is one mile round trip and family friendly. Join the Ogden Astronomical Society in White Rock Bay at 6:00 pm. They will start with solar viewing then switch to night sky viewing at dark. Use their amazing telescopes to see our spectacular skies! Please make sure only red-filtered flashlights are used. Is the Fielding Garr Ranch Haunted? Come and see for your self. Meet at the Fielding Garr Ranch at 8:30 pm and learn about methods used to detect unexplained things. You will be allowed to wander through the buildings looking for evidence of visitors from beyond the grave. Please bring a flashlight and camera. For more information call (801) 649-5742. Come and join us for a day filled with the island’s sheep history as we celebrate our sheep shearing barn and the island’s sheep history. Come and watch the shearing system in operation at 11:30 am, 1:30 pm & 3:00 pm. There will be a wool processing junior ranger program about how sheep were sheared and wool was processed on Antelope Island at 11:00 am. (There will not be any sheep sheared during this program.) Though this informative Junior Ranger program is geared for ages 6-12 people of all ages are welcome. There will be a History of Sheep Ranching on Antelope Island Lecture at 2:00 pm on how Antelope Island’s sheep industry influenced Utah’s wool market at the Fielding Garr Ranch (There will not be any sheep sheared during this program.) For more information call (801) 649-5742. Junior Ranger program: What did Native American inhabitants of Antelope Island Eat? 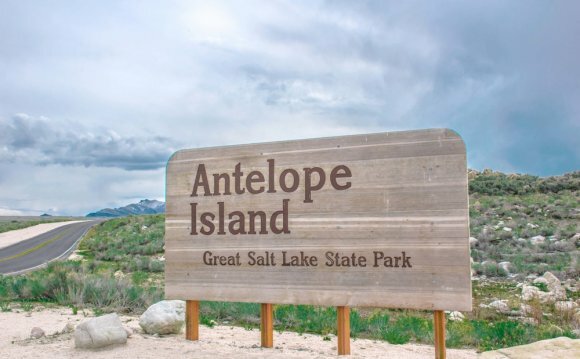 Come and join us for a fun filled experience learning about how Antelope Island’s Native peoples gathered food at 1:00pm at the historic Fielding Garr Ranch on Antelope Island State Park. Though this informative Junior Ranger program is geared for ages 6-12 people of all ages are welcome. For more information call (801) 649-5742. Come and join us in celebrating the West in our 11th annual Cowboy Poetry and Music gathering at the historic Fielding Garr Ranch on Antelope Island State Park. For more information go to www.CowboyLegendsAI.com. Join the Ogden Astronomical Society in White Rock Bay at 7:00 pm. They will start with solar viewing then switch to night sky viewing at dark. Use their amazing telescopes to see our spectacular skies! Please make sure only red-filtered flashlights are used. Come and join us at 2:00 pm for an informative lecture about the history of Antelope Island’s bison at one of Utah’s earliest ranches, the historic Fielding Garr Ranch on Antelope Island State Park. For more information call (801) 649-5742. Check back often for a list of other upcoming events.